This week on Facebook and Twitter we are showcasing a number of photos of profile walls from our excavations, in a section called “Stratigraphy Week!” I thought this would be a good opportunity to discuss one of the more important elements of archaeological excavation: reading stratigraphy. Stratigraphy is the result of what geologists and archaeologists refer to as the “process of stratification”, or the process by which layers of soil and debris are laid down on top of one another over time. 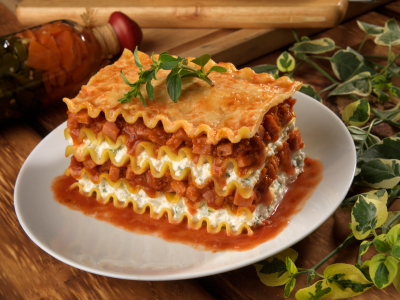 The easiest way to think about stratigraphy is as if you were making lasagna: first you put down the first layer of pasta, then cheese on top of that, then sauce, then another piece of pasta, and so on. There is no way for you to put the bottom layer of pasta on before you put the sauce on, and still maintain the same sequence or location of these different layers. Where one layer overlies another, the lower layer was deposited first. When an archaeological unit is done being excavated, the walls of the unit reveal the different layers of stratigraphy. Archaeologists are then able to tell which of these layers happened before or after layers. Sometimes, these strata can be confusing: rodent burrows, post holes, or erosion can make the stratigraphy much more difficult to read, because they disturb the natural layers. For archaeologists, however, these intrusions are important, because they are often the product of human behavior. This means that these modifications to the earth can be dated and analyzed in relationship to each other. Artifacts can make dating these layers even more precise, but that is another discussion for another time. First, let’s take a look at some examples. This photo on the left is a close up of some stratigraphic layers which have been labeled. 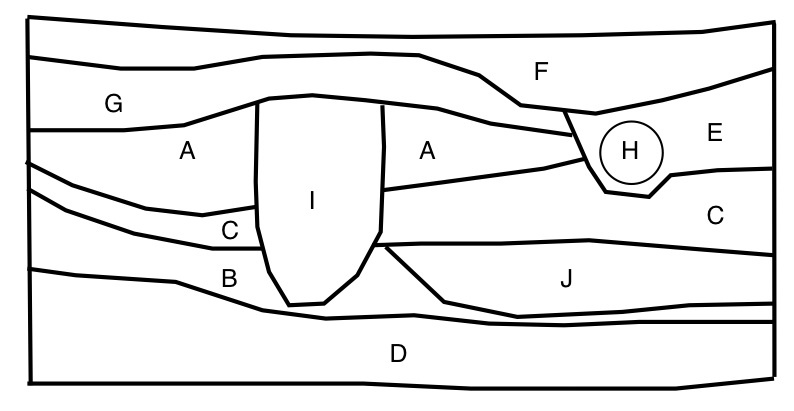 Each layer is sequential: the lower B came before the lower A which proceeded the higher B, which came before the top A. When we excavated, we started with the Top A and moved downwards, back in time. Now let’s try one a little more complex, using a drawing of a fictional wall profile. This profile has some intrusions in it, so that makes the sequencing a little bit more difficult. See if you can place the layers in order from oldest to most recent. The answer: C is the oldest. Then F, A, D, G, E, and B. F comes after C because it is an intrusion into that level, meaning that C must exist in order for F to be dug into it. the relationship between A, E, B, and G is also complicated. G happened first, then E, then B. It is as if E is the toothpick that is plunged into a club sandwich, and G and A are the layers of bread: E must happen after G and A. B is entirely within E, so it must have happened after E. Most likely, B is a pipe that was placed in a ditch, which is intrusion E. Does that make sense? Don’t hesitate to ask any questions about stratigraphy either. For more pictures of stratigraphy, visit our Flickr Page! 2010 Summer Field School Announcement! d,b,j,c,a,i,g,e,f(or h) did an animal burrow through f to make h? I got the same as Janet. Could you confirm to us the answer? 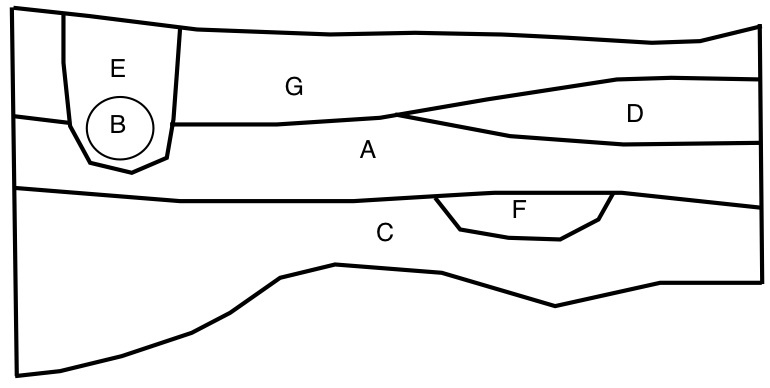 I had a question about the last Stratigraphic profile pictured, if what Janet said was correct, what would the harris matrix solution look like? I agree on d, b, j, c, a, i but i think it is e, h, g and f and not g, e, h, f.